I love the low FODMAP diet as I can see first-hand how much it helps people with Irritable Bowel Syndrome. But sometimes people with IBS struggle with more than just knowing what to eat on the low FODMAP diet. Cravings for high FODMAP foods can sometimes derail the best of intentions! It seems fitting to write this post around Halloween and leading into the Christmas holidays. Between Halloween and Christmas, there are high FODMAP temptations EVERYWHERE! Lately, I’ve read several blog posts about low FODMAP candies and low FODMAP baking to “save” you when you have a desperate and insatiable craving. It is definitely great to have delicious low FODMAP options available. Read on to get my low FODMAP snack download. But, what if your craving was not caused by hunger, but something else? Is food always the answer? No, not always. I’m going to teach you how to understand your cravings so you don’t struggle with those intense, urgent feelings anymore. We will dig a little deeper to investigate why your cravings exist and I’ll give you some belly saving strategies so you can get through your day, make smart choices and manage your IBS symptoms. A craving is a powerful desire for food. While some people crave healthy foods, it is often the cravings for foods like pizza, chocolate, chips, ice cream that are the most fierce. We all have cravings at times and before we look at strategies for dealing with them, we should talk for a few minutes first about what causes them. Look around, sometimes it feels like we are living in a candy store. No wonder you crave a chocolate bar while paying for your groceries. They are placed right beside you, strategically at eye level and are on sale – 2 for 1! That’s it, game over. You end up taking two home and eating one in the car. We are all bombarded with marketing as companies spend zillions of dollar to get your mouth watering over their product, and it works. Unfortunately, most of these foods lead to excruciating IBS symptoms and they are not healthy for anyone. Skipping meals may seem harmless at the time, but your body will find a way to catch up. It is usually in the evening when you are feeling a bit tired and not on top of your game. Let’s not ignore another obvious reason. The low FODMAP diet is restrictive at times. Seeing other people eat your favourite foods makes you want them even more. Don’t despair and read on! I have been a Registered Dietitian for 15 years and have helped many people manage their cravings and improve their symptoms of IBS through diet. 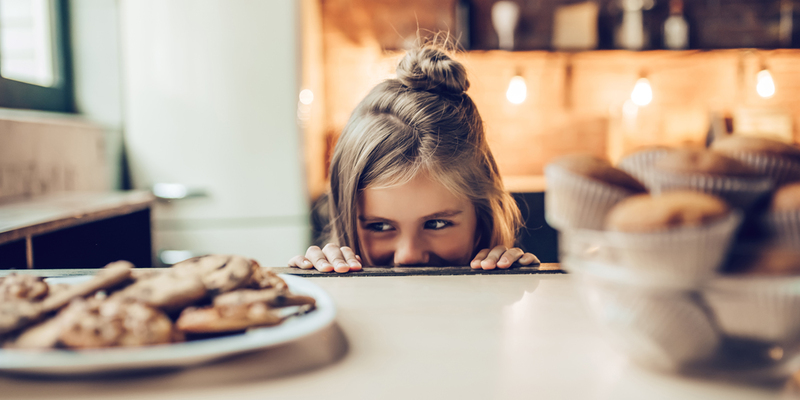 Here are some strategies that can help when you are blindsided with cravings. Step 1 – Rule out hunger and thirst. First ask yourself, “Am I Hungry?” If the answer is yes, great. This is normal, biological hunger. Eat something healthy and low FODMAP. 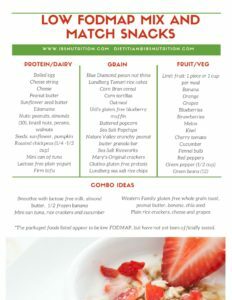 To help you with that, I’ve included a downloadable snack handout. Are you thirsty? Have a glass of water or tea. Not hungry or thirsty? Then what? Step 2 – Dig a little deeper. Are you bored, tired, cold, worried, or anxious? Our thoughts and feelings are HUGE triggers for eating because food (especially the high FODMAP types) can serve as a temporary solution and great distraction. Unfortunately, when the food is gone, you may feel crappy and the original feeling comes back again. First, identify what you are feeling, then make a list of better solutions. For boredom, read a book, go for a walk, or listen to music. Anxious or worried? Meditate, breathe deeply, do some stretching, or call a friend. If you are cold, have a bath, put on a sweater or have a cup of low FODMAP tea. I think you get where I’m going here. Take note of what you are feeling and then think of some good solutions to solve the problem without food. Step 3 – Notice habits. Many people crave junk food as soon as the TV turns on. Does this happen to you too? If you regularly eat in front of the TV, then you have taught your brain that TV is a trigger for eating. It’s pretty tough to stick to your FODMAP limit of popcorn when your hand is mindlessly dipping back into the bowl and you are focused on your TV show! I often suggest that if you crave high FODMAP foods while watching TV, take a break from your show, eat a low FODMAP snack, eat it mindfully, and then go back to your show. It may feel weird at first, but it will put you in a better position to stay within your FODMAP limits. This may surprise you but cravings are predictable. Do your cravings hit mid afternoon or in the evening? Is it a specific type of food you crave? Anticipate when your cravings will hit. You can often pinpoint it to a specific time of day or a special event (holidays or family meals). Can you now start to see a pattern? You are standing in front of the freezer with a spoon in your hand ready to dip into the ice cream. First, take a deep breath and think about how you will feel later. Will you feel disappointment or pain? Refer back to Step 1 to investigate why you want the treat in the first place (boredom, anxiety, etc). Step 6 – Change your environment. Get into the habit of always looking for ways to change your environment to reduce your triggers and temptations. The bowl of Halloween candy needs to be put away, out of sight and preferably somewhere that is highly inconvenient to access. Don’t rely on will power and self control. Our environment has a HUGE influence on what we eat! Give away the high FODMAP foods in your kitchen and remind yourself that the elimination phase is only temporary. Make sure your fruit bowl is filled with low FODMAP fruit like mandarins, oranges, bananas, kiwi. Don’t torment yourself with a bowl of apples and pears. If you must have chips and cookies in the house, make them inconvenient to reach and hard to find or better yet just don’t buy them. If waiting in line at the grocery store right beside the chocolate bars is unbearable, go to the self check out or try ordering your groceries online. Give yourself enough time in the morning to eat breakfast at home. It really only takes 5-7 minutes to prepare a healthy breakfast like oatmeal, a smoothie or peanut butter on gluten free toast. Pack low FODMAP snacks before you run out the door. Be in the habit of bringing food with you everywhere so you don’t get caught where your only option is pizza. This part of the post is inspired by one of my clients who was in a hurry the other day, grabbed a Fibre One bar (high FODMAP) on his way out the door and then his only option for lunch was pizza. The poor guy was not well for the rest of the day. I created this snack list with super fast ideas partially with him in mind. Step 8 – Eat mindfully. It is possible to eat a small piece of dark chocolate and leave the rest for later. You are capable, I know you are! The trick is to eat mindfully. Don’t do anything else while you eat, just eat and savour the food. That means no phone, TV, Facebook, or computer. Serve yourself a low FODMAP portion and eat it from a plate, not from the package and definitely not with a fork right from the fridge! The main point here is that if you just focus on the food and enjoy how delicious it tastes, you’ll feel satisfied with less. Cravings are not inevitable with IBS and the low FODMAP diet! You can survive on the low FODMAP diet, manage your IBS symptoms and have NO cravings. It often requires a change in your way of thinking, a change in your environment, some great low FODMAP resources, and encouragement along the way. As a Dietitian who is trained in the low FODMAP diet and the Craving Change program, I hope that I have helped change your way of thinking so that you are better prepared to make great food decisions and get rid of your IBS symptoms. I am a registered dietitian who specializes in IBS and the low FODMAP diet. I am based in Edmonton, Canada and I offer nutrition counselling by phone and video to anyone across Canada. If you are looking for help, have a look at my nutrition counselling page or get in touch for a free appointment. Awesome post, thanks for writing about this. These tips are awesome! Thank you for sharing and breaking down all of these into steps!